When the new government came, new disaffected people appeared. Rallies to support Russia and Putin stormed in Donetsk. Pro-Russia activists are demanding federalization referendum, they seized Donetsk Oblast State Administration building and temporary stopped transportation traffic in the city. This was the main topic in Donetsk printed press. Zhyzn Newspaper №31 dated 5.03.2014, article Donetsk Oblast: Speakers and Governors: At the same time with the session meeting on the street in front of the Oblast Administration building pro-Russian protesters` rally took place. Their representative Pavel Gubarev elected by the protesters as a people’s governor spoke during the session as well. He demanded from the deputies to declare that the government authorities in Kyiv are illegitimate and set a day for regional referendum on federative status of Donetsk Oblast. The Oblast Administration deputies did not support these radical demands of the protesters. The protesters were not satisfied with such statements and they started storming the Oblast Administration building. As of Tuesday evening they had seized the first two floors of the Administration building. All directorates and departments were paralyzed. Law enforcement officials guarding the building engage into a power struggle with the protesters to avoid conflict escalation. Currently, a criminal case was opened over Donetsk Oblast Administration building seizure. According to Head of Main department of Internal Affairs in Donetsk Oblast Roman Romanov police is verifying whether citizens of Russia took part in the upheavals and Donetsk Oblast State Administration building seizure. Zhyzn Newspaper №32 dated 06.03.2014, article Protesting Donbass: The wave of radical protests and calls to change government structure of Ukraine that reached Donetsk has catalyzed its citizens. On Tuesday several thousands of Donetsk citizens came out on the streets to voice their protest against aggression escalation in Donetsk Oblast. The main message of the rally organizers was to refuse any party rhetoric to express the opinion of Donetsk and Donetsk Oblast citizens protesting against outrage and abuse of power. Most protest participants on Tuesday night by Spaso-Preobrazhenskiy Cathedral were young people. Those gathered togethered held flags and posters saying I am Outside of Politics! I am Against War! No to Separatism! Russia is not an Enemy! Ukraine is United! Dontesk and Sevastopol Together! Donetsk and Lviv Together! Praise to Ukraine! 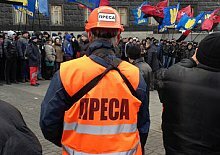 Praise to Donbass Coalminers! It is worth mentioning that there were no party or pronounced radical slogans and calls during the protest, instead Donetsk citizens had traditional peaseful protest with positive and adequate spirits. This initiative was developed. On Wednesday about five thousand Donetsk citizens gathered on Lenin`s Square. Earlier, there was a radical protest by the Oblast Administration building. Yesterday they stormed the building again seizing all floors of the Oblast Administration, braking several windows and raising Russian flags. The crowd chanted Referendum! Later they moved to Lenin`s Square where other protesters held Ukrainian flags and demanded from Parliament deputies to change the Law on Languages and broaden the powers of local authorities urgently. Between protestors from different sides police formed a cordon, however this did not save some radical representatives from local confrontations. Clashes started as early as on Saturday, March 1st when protests that are so regular for the citizens got very acute. Dontesk started hearing calls to not acknowledge the current government not only in Kyiv, but on local level as well. The protesters even elected a People`s Governor, voiced their demand to hold a referendum on federative status of the region. In essence, since Monday, when Donetsk Oblast Administration building was seized the local oblast authorities could not even work. Zhyzn Newspaper №33 dated 7.03.2014, article The Lid Came Off: On March 5th in Donetsk several unauthorized mass protests took place as a result of which unknown people seized Donetsk Oblast State Administration and Donetsk State Treasury buildings. Moreover, on the main square, a clash between pro-Russia activists and citizens supporting the unity of Ukraine took place. As a result of the conflict three people received minor injuries. Donetchina Newspaper №15 dated 7.03.2014, article Strangers in Our Home Town: On Wednesday a patriotic rally under a slogan No to War! took place on Donetsk Lenin`s Square. This rally was the largest through out the Donetsk history. Around 5 thousand Donetsk citizens took part in the rally. However, the rally participants were surrounded by aggressive Putin supporters who started throwing eggs, apples and fire crackers into them. After the rally people that looked like skinheads started chasing citizens with Ukrainian symbolic. Several major fights took place. As a result there are injured and arrested. It is known that the attackers used metal rods, telescopic poles and applied gas. A knife covered in blood was found on the place of fight. There is information that among the attackers there were Russia citizens and local thugs. However, according to preliminary information none of those throwing eggs and initiating fights was arrested by police. In addition, pro-Russian activists rocked a police van and caused an accident in which the police van rammed into a highway patrol vehicle after the thugs started preventing it from leaving. Soccer fans Ultras that supported rally for United Ukraine participated in the fight. These young people let other peaceful participants of the rally to leave safely and as a result they took the heat. On the same day pro-Russia thugs were thrown out from Donetsk Oblast Administration building, but later they came back and seized all the floors. Around 9PM about 40 athletic men with St. George Ribbons seized the hall in Donetsk Oblst State Treasury building. As one of the intruders explained: “We are no seizing, we are just taking what belongs to us.We have our governor Gubarev who tells us where we shall go.” Gubarev is demanding to hold a referendum for separation of Donbass from Ukraine and has asked Putin to bring Russian troops into Donbass. Donbass Newspaper №26 dated 4.03.2014, article Protesters Seized Government Building: Many public figures were involved into organization of the demonstration that was held yesterday, however, it appears that thing did not go the way they were supposed to. The protest leader called the participants to keep calm and not to fall for provocations. However, people on the square started chanting Berkut! (Ukrainian riot police - TN) and Russia! interrupting speakers on the stage. A fight started over a chance to speak into the microphone. A young man trying to go through police cordons at first was called a provocateur. However, in two or three minutes the provocateur talked to the people. It emerged that it was Pavel Gubarev the Head of Donbass Militia who several days ago demanded from the City Administration to not recognize the Oblast administration and Parliament and Government and take all responsibility for everything that is happening in the region. The activist called people to elect a new governor right on the square. Approximately at the same time Vostochniy Front representatives, Russia and Ukrainian federalization supporters gathered by Oblst State Administration. In front of representatives of different associations and the Administration itself gathered in front of Oblast State Administration calling people to calm down and not fall for provocations. In one hour after the beginning of the rally journalists were invited to the press conference given by the Governor. However, he did not manage to finish the press conference since the protestors rushed to the building entrance and police had to block all entrances and exits from the building. Journalists were asked to go to the forth floor into a safer place. The first floor was taken by Grifon and Emergency Service soldiers that unrolled water cannons to cool down the most active protesters in case of a storm. In face of all protesters the Ukrainian flag was taken down and changed for Russian one. Journalists and Administration officials were evacuated by Security Service via another exit. And the protesters stayed in front of the building demanding to hold referendum and granting Donbass autonomy status. On the early morning On Sunday, federalization supporters started pitching tents by the Oblast administration building. On the same day around 30 people tried to hold an anti-war demonstration by Shevchenko monument where Donetsk Euromaidan took place. The posters held by these protesters said No to Occupation! Freedom and Peace to Ukraine! Stay Out of Our Way! Despite the absence of any party symbolics these protesters were not allowed to hold their protest. There were no clashes that day, but journalists were injured, i.e. 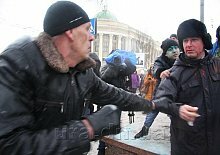 tree Mass media representatives were beaten by pro-Russia activists on Lenin`s Square. One more person was injured by Shevchenko monument. Some serious events took place on Monday. In the morning the State Administration was cordoned off by police since Oblast Administration deputies decided to hold and unscheduled meeting. About one thousand protesters came to the building as well. During Andriy Shyshatskiy`s meeting Pavel Gubarev appeared in the convention hall. He literally pushed Shyshatskiy out of the stand. He read his demands and said that the deputies shall not recognize the acting government as legitimate. People in the building became hostage of the roaring crowd. They gathered on the fourth floor and whispering to not escalate panic started sharing their concerns: what is most important is that the invaders do no set the building on fire. Soon the door to the entryway opened. However, the hostages faced strict face control at the entrance: journalists and support staff were let go and the deputies were taken back to the convention hall. In this hustle and bustle even Shyshatskiy caught it bad: the protest participants forced him into a punch up and started beating him. Article Protesters under Russian Flag Demanded to Wack Them: Perhaps the most large scale rally in its history took place in the city: those who wanted to express their opinions filled the square by Lenin`s monument. The protesters held tree Russian flags and one Afganistan Veterans Association flag. There were no Ukrainian or party flags. Some groups of young people stood out, many of those young people were tipsy. Those gathered on the square were chanting Praise to Donbass! Berkut! Russia! Referendum! New Goverement Down! Apparent aggression was present as well. One of the present shouted Praise to Ukraine! And over a dozen athletic guys rushed after this parson, but he managed to escape. One more woman was almost beaten by the Executive Committee building: with her speech she tried to stop conflict escalation calling not to instigate 3rd World War. This speaker was saved from an aggressive opponent by men that appeared wherever there were heated discussions. Vecherniy Donetsk Newspaper №26 dated 4.03.2014, article Revolution Weekend: On Saturday in Donetsk anti-fascism pro-Russian protests took place in Donetsk. These events gathered over 15 thousand people. The protests against the current government and radical groups were held under Russian flags. Donbass Militia Leader Pavel Gubarev who managed to get on the stage called the protesters not to submit to the Parliament, Donetsk Oblast State Administration and oligarchs that recognized the new government. After the meeting almost all the participants went to Donetsk Oblast State Administration where they kept demanding to hold referendum and also to talk directly to Donetsk Administration. Ukrainian State Flag was taken down from the pole and tricolor was raised instead. Moreover, the protesters tried to storm the Donetsk Oblast State Administration building and called police to join people. In the midst of the protest unknown people set off two thunder flashes. On Sunday about one thousand of people were protesting under the Donetsk Oblast State Administration building, as before they held Russian flags. Party of Regions counseling office located not far from the Oblast Administration was taken by the protest participants. All identification signs were taken down from the building. On Lenin`s square “peaceful protesters” called some Donetsk journalists provocateurs and beat them. Vecherniy Donetsk Newspaper №27 dated 7-13.03.2014, article Donetsk is fighting: Pro-Russia activists that seized Donetsk Oblast State Administration on Wednesday afternoon were evacuated from the session room due to the information that there was a mine in the building. Police and bomb technicians detected an anti-personnel mine in the building. On that day three thousand pro-Russia activists kept protesting on Oktiabrskaya Square headed by people’s governor Pavel Gubarev. The protesters chanted Sevastopol! Berkut! Russia! And demanded to hold a referendum on Donetsk Oblast territory status. Amidst this Pavel Gubarev came out to the people and from the improvised stage started assuring all present that he is going to go to the very end. At this point the people’s governor shared his plans: to connect with the only, in his opinion, legitimate government in the country, i.e. Crimean Parliament. In one hour shouting Police is with People! the crowed rushed to storm the Oblast State Administration building using the jot down Monday plot. This time pro-Russia activists got into the building through the central entrance having broken the door glass. The got into the building that was left without power by then. It is worth mentioning that there were clashed among those who came to storm the building since people tried to determine who was a provocateur and who came from Rostov and who was a real Donetsk citizen. Donetsk citizens that do not support separatist movement planned to come out to Sviato-Preobrazhenskiy Cathedral a day before. On Tuesday and on Wednesday in the United Ukraine supporters crowd there were no political parties flags, just multiple national flags and yellow and blue balloons. Their rally was circled with police and in-country forces cordon. Thus, the main Donetsk square was divided into two fighting camps. i.e. pro-Russia and pro-Ukraine. Passenger car morocade with national symbolics was part of the pro-Ukrainian rally. Pro-Russia activists took it very negatively breaking bottles against cars, hitting wheels and stripping off Ukrainian flags. As soon as pro-Ukrainian protesters started chanting Praise to Ukraine! Praise to Heroes! The pro-Russia supporters went ballistic. Such slogans was like waving a red rag in front of a bull – pro-Russia protesters started throwing eggs, flour, apples and fire crackers into their pro-Ukraine opponents. The pro-Ukrainian protest speaker tried to calm people down, assuring that pro-Russia supporters will run out of their “ammunition” soon. After the end of the pro-Ukraine rally police cordons started taking pro-Ukraine supporters to the Ministry of Coal industry building while pro-Russia activists tried to circle those protected by police. Clashes took place anyway – people with St. George Ribbons started beating both opponents and law enforcement officers.